I love this image! The sweet couple remind me of my Mum and Dad. It’s also a reminder of what I want for my own marriage, and the sort or marriage I hope all the couples in my stories will build, with God’s help! But 50/50 seems on the surface to make sense. It can feel like it’s fair to divide things equally. He does his half, she does her half, and they have a whole. That’s the theory, anyway. I’ll admit, I went into my marriage with the 50/50 idea. My husband and I weren’t kids straight out of college, but were one year either side of forty. We both had achieved decent success in our careers. We both owned our own homes. We both had full busy lives. Our marriage was going to be divided right down the middle. Equal work, both inside and outside the home. Equal financial contribution. Equal effort to make things work. 50/50. It didn’t take me too long to discover, 50/50 does NOT work! It was fine at first, though there was a sense of always keeping score, running a constant calculation of how much we each felt we were putting in versus how much we were getting back. “I gave you that much, so I expect you to give me this much.” Inevitably, each of us felt we were giving up more than the other. Then my husband became too ill to work. For many years, I was the sole income earner. I took care of the finances and the bills. He took over the housework. Hoo boy! Things really escalated then! We had so many arguments over who was doing more, and how much each person’s contribution was worth. For a long time, our marriage felt very unbalanced for both of us, as we struggled to adjust to our changed roles. Holding onto our old 50/50 beliefs led to love-killing resentment on both sides. Eventually, the light-bulb switched on. My attitude had to become one of giving freely, rather than “it’s not fair”. It took a long time, but I learned to throw away the score card and appreciate all that my husband did. I had to learn how to truly love! God reminded me that my marriage vows didn’t say anything about fairness. Instead, I promised to “provide love, friendship, help and comfort, both in times of joy and in times of difficulty.” Keeping score and wanting things to be “fair” held me back from fully surrendering myself to a truly loving and giving relationship. Marriage can seem unfair. Love can seem unfair. We can seem to be asked to give so much more than we’re getting. Or sometimes the opposite. Receiving more than we’re able to give or seeing our spouse making sacrifices for us can leave us feeling guilty and uncomfortable, worried the other person could come to resent us. We need to learn to be okay with both, and keep on loving! That’s the situation my current heroine Maggie finds herself in. Even older than my husband and I were when we married, she’s 52 and he’s 55! They both have full busy single lives, and getting romantically involved will change everything. He’s risking losing a lot to date her, let alone marry her. So, should she end their growing relationship, for his sake? Or is her attempt to protect him a way of avoiding her own fears of surrendering to love? I’ll be releasing this novella very soon as a free gift for my monthly newsletter subscribers. To find out more, visit the Least Expected book page on my website! 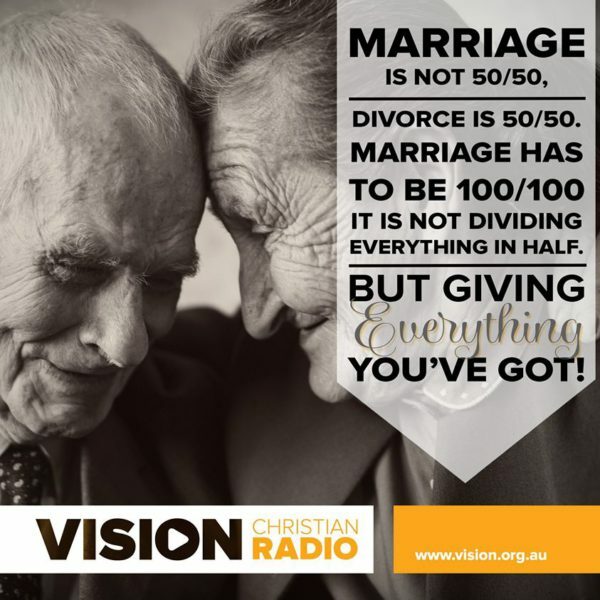 For me, I think giving up the 50/50 rule was one of the biggest transformational breakthroughs in my marriage. I just wish I hadn’t been so stubborn and taken so long to learn it! I’d love for you to share in the comments a lesson you’ve learned about love and marriage that you wish you’d known sooner. One reader who comments on the post by July 8 will be chosen at random to receive the ebook of their choice from any of my releases (excepting the multi-author boxed sets). If you don’t yet have the Whispers of Love 12 book boxed set, there’s only a few days left to snag it at the special release offer of 99c. The price rises to $4.99 on July 4th! I love that image too, Autumn. 1 Cor 13:4-7 is one of my favorite go to verses when things get stressful in our relationship. Fortunately, I learned many years ago that, ‘It’s not fair,’ is a dangerous mindset to slip into. I had my light-bulb moment after experiencing some serious health issues…100/100 is the key. God so often seems to use health issues as wake-up calls. It kinda gets our attention! Thanks for a thought provoking blog! I John 4:11. God loved us and we need to love one another. 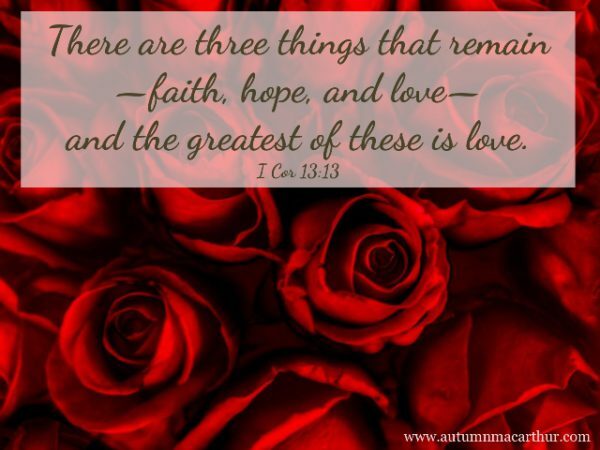 I Corinthians 13 tells us how. Therefore love is a choice. So much of modern culture is to fall in and out of love. In June my husband and I celebrated our 43rd wedding anniversary. Has it been easy no, not after 3 children, 10 moves, a devastating house fire, loss of parents, changing jobs and careers. We tease, he has been happily married for 22 years, and I have been happily married for 21 years. When he is happy and having is need met, I am not so happy. During a given year, he makes me happy from Mother’s Day to my anniversary June 16 (my birthday is May 28). I make him happy from our anniversary to July 28 (his birthday). Our anniversary falls in between. He also admits that I will keep him, because after 43 years of marriage, I know how he ticks. It would be a lot of hard work to train a new husband. ONE question INSPY WRITERS???? Why in most romances is the girl always younger than the guy???? I am 14 months older than my husband. My son is 18 months younger than his wife. I have several female friends that are 4 or 10 years younger than their spouses. But I’m mostly grateful! God’s grace isn’t “fair” either. So thankful we don’t get what we deserve with Him! I do have an unfinished story where the woman is older, by about six years if I recall correctly. Hopefully I’ll complete and release that next year, but it keeps getting pushed back in the queue! I’m five months older than my husband, and our daughter is older than her husband by the same amount. Our son is older than his wife by 14 months. Interesting thought, Renate, and one I’ll put into practice soon! The other thing I wonder about is why any romances under the age of 25 are seen to be kids. We were 21/20 at marriage, and I don’t regret it almost 36 years later. Our kids were 22/21 and 21/19 and have been married for 13 and 12 years now. Sure there are ups and downs, but people in their late 20s and older also have them, just different ones. Hmm. I feel a blog post coming on. Valerie, that is so true about there being issues at any age, just different ones! Renate, I’m 2 1/2 years older than my husband, and in my book, NURSING THE SOLDIER’S HEART, my heroine is 5 years older than the heroine. Great blog post, as always, Autumn! I need to remember this the next time I grumble because Jim doesn’t do something I want. He’s in the basement more than I am–a LOT more since he watches TV there and his computer his downstairs–than I am. And that’s two flights down and back up again to my home office. The washer and dryer are in the basement. Can’t he fold towels and check on the laundry more often? What I’ve found is that he’ll often do it if I only ask. Who knew? Sometimes he forgets, but that’s okay. Thanks for the reminder to throw away the scorecard and appreciate all he does! I LOVE that advice! :) Your novella sounds terrific, and I’m sure a lot of readers will adore it! Blessings. LOL, I think we all do forget to ask! My husband is wonderful at doing things, once I ask. But it’s taking me a looooooong time to let go of expecting him to notice I need help, or just somehow know. And appreciating what others do for us makes everyone feel good. Gratitude is a wonderful thing to both feel and to give! Love this, Autumn! It’s sometimes so hard to let go of that notion of fair. It surely is hard, Elizabeth! Thanks for the reminder, Autumn. Besides being unbiblical, “fair” is super subjective! So true, Margaret! It’s a lovely fantasy, and I think as time goes on we can get better at anticipating our partner’s needs, and them ours. But to the level we’d like, nope. We need to talk! Interesting how many of us are older than our husbands. Obviously that age difference thing is less prevalent than I thought! Hi Autumn! I love this post. The main thing I learned in my two marriages was that when I was worn out and felt like I had to do everything, all I had to do is ask and they would help. I think they just didn’t have any idea what needed done. I think everyone just keeps their feelings to themselves or get frustrated and all we have to do is ask. This reminds me of life in general. We all try to do it all and figure it out ourselves, when all we have to do is ask God to help. That is so true and so wise, Robin. Fear or that expectation “they should just KNOW”, can hold us back, when if we ask, the answer will so often be “Yes”. Thanks for reminding us about the 100/100 part of marriage. I don’t think it’s something we can be reminded of too often! And again, I’m surprised how many of us here are older than our husbands! Thanks for sharing your story. I’m probably one of the youngest here and still my husband and I have learned to talk through everything early on (before getting married). Best thing that happened to us (he was very quiet to share about himself in the beginning and now I have to ask him to stop talking some days). I’m glad you learned that early, Priscila! The give and take of communication is one of the most important things to make marriage work, and sometimes the thing we can take longest to figure out. Or LOL, maybe that was just me? <Marriage like life is what you make of it. If you make it a priority it becomes one. Love is a choice…..make it the best one!! I’m nearly 10 years younger than my hubby. I was 19 and he 29 when we met. Interesting to take him home to meet the parents the first time (who were farmers 3 hours away) and tell them we planned to marry in 18 months…yes the first time they met! Celebrated 32 years this year so I picked a good one…took a few years to train…kidding! And please can we have less car accidents to ‘lose’ people not central to stories. Thanks to wonderful authors who work so hard to inspire us and entertain us. Wow, that’s an impressive age difference! But clearly you found a keeper there! Good question about disabilities! They are with us in real life (my husband is high-functioning autistic, and I have developed an unusual neurological disorder), so why not in our stories? I think perhaps because they are more of a challenge to write! I do have one series, the Macleans, that deals with disability quite a bit. The older brother has cerebral palsy and is on the autistic spectrum, he’ll be hero of book 4, which I hope to release early next year. In Book 1, A Model Bride, the second brother discovers what it’s like to be disabled when he is wounded by a bomb blast. Book 2, More than Friends, involves supporting disabled kids to be part of the church, Book 3, A Lesson in Love, also deals with living with disabling conditions. I LOLed at the car accident remark! Too true. I notice a LOT of my characters have been orphaned in their late teens or early twenties by car accidents. I think that’s mostly in my not-yet-published books. It does make life so much easier for the author if we bump off those pesky secondary characters!